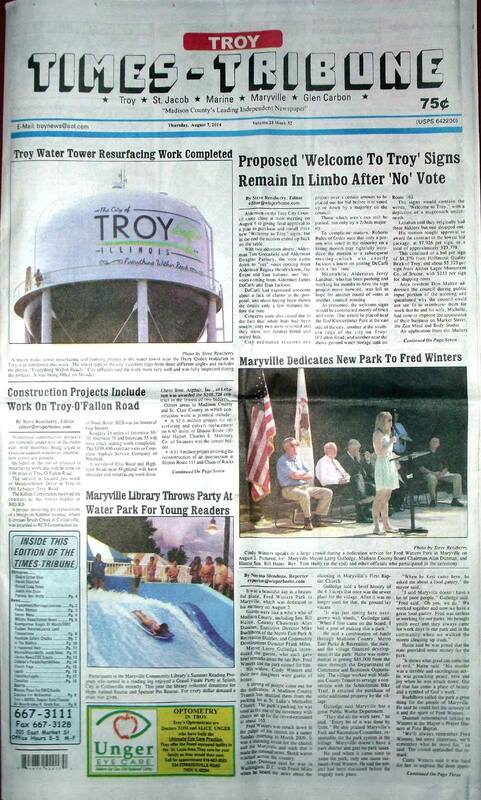 The August 7, 2014 issue of the Troy Times-Tribune is now available. As a reminder, subscriptions to the Times-Tribune are available by calling 618-667-3111, by visiting our offices at 201 East Market Street in Troy, 8 a.m. - 5 p.m., Monday through Friday, or by sending us a letter asking to subscribe. To place a display or classified advertisement, please call or stop by our offices. Some of the headlines in this issue: Proposed 'Welcome to Troy' Signs Remain in Limbo, Maryville Dedicates New Park to Fred Winters, Construction Projects Include Troy-O'Fallon Road, Marine Man Arrested on DUI Charge, a sports feature on Troy native baseball player Cody Massey, Chamber of Commerce Presents Series of Events; plus a full page of photos of the Troy Homecoming children's parade and The Reptile Show, a column about bridging the digital divide, police blotters, commodity news, the weather forecast, and much more! We have obituaries in this issue for Gladys Esther Bliss, Harold Oberkfell, Ronald Craig Rolen, Judith Ann Stice, and Patricia Ann Wolfe.